Smoke free, Pet free, Recent MOT, Auto Stop - Start, Hillstart Assist, Bluetooth Hands Free Facility, On - Board Computer, Tyre Puncture Warning System Next MOT due 02/01/2020, Black, 5 owners. Child seat points (Isofix system). Honestly a great looker and very cheap to run! Blue, 3 owners, £6,999. BMW 1 Series 116D Sport. Last service and MOT Jan 2019. Small crack and scuff on bumper as shown in photo. Kings Norton, Birmingham. £3500 OVNO. Recently had a full service carried out at 146,000 including new discs and brake pads (£420) and also had the clutch and flywheel replaced (£600) on the 17/04/19. I have all the receipts of work carried out to prove this. In good working order, would be in great condition if our puppy hadn't chewed the handbrake! Must go as we don't have space on the drive! **Easter special £100* off screen price/ Finance available from £0 Deposit 2006 BMW 1 series 118d sport 2.0 Diesel chain driven no cambelt MOT 18/04/2020 last owner for 8 years 119k 2 x keys Remote central locking Climate control CD Player Electric Windows Electric Mirrors Parking sensors 6 speed manual Isofix Sports seats Trip computer Alloy wheels Aux imput Finance available from ££25 per week Part ex taken at trade rates * Show this advert to claim offer/ Finance subject to status. blue 78000 miles 6 SPEED! TURBO DIESEL! EXCELLENT CONDITION & DRIVE !! JUST BEEN SERVICED !! FULL MOT! NEEDS TLC! RING FOR INFO! Bmw 1 series, cat N wing change, mileage 137000. Good condition inside outside age related marks but very clean condition clean engine no bangs no issue. MOT expire in NOV 2019. 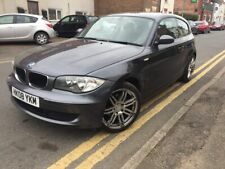 2011 BMW 118D SE AUTO 5 Door Hatchback in excellent condition with loads of extras, Leather Seat, Sat Nav, Front And Rear Parking sensors, Usb input Aux input, Cat N, Long MOT Next MOT Due 04/02/2020. Model : 1 Series 120D 2.0 SE. Type: 120D OL (EUR). Mileage: 65,870 miles. Mileage: 60,452 miles. Body Type: COUPE. Body Type : Coupe. Fuel : Diesel. Mileage: 45,207 miles. 2007 BMW 118d SE 2.0 5 Door Manual Diesel Silver AC Alloys 2 Previous Owners Years MOT 72,000 miles LS57HSF. This BMW 118D SE in in truly excellent condition. Model : 1 Series 118d SE. Model: 118D UL (EUR). Star motors - Call us on 441895542958 or click here to find out more. BMW 116 D Sport - 5 dr - Burnt Orange - Light front damage including Suspension & N/S Air Bag - Cat N - MOT 25.09.19.